I'm currently developing a piece of software as coursework for a class and I've elected to make a Windows App and Windows Phone App. Being hit by the knowledge that Entity Framework 6 wasn't supported almost made me give up, but I started a complicated workaround with a data server before finding EF7. I figured I'd give one of the releases from GitHub a try, so I downloaded it, built the Entity Framework 7 project successfully, referenced it successfully... And hey presto, my code files are suddenly perfectly happy with their DbSet and DbContext references. I did a bit of glancing and found that in my references, Dependency Injection seems to have no version listed unlike some of the other references, and I was thinking that might be something to do with the issue. I've tried reimporting, rebuilding my copy of EF7, and nothing seems to work. I've no idea where to go from here and if someone could tell me what I've done wrong it'd be a great help! I've probably made some naÃ¯ve mistake somewhere and I apologise in advance for that. 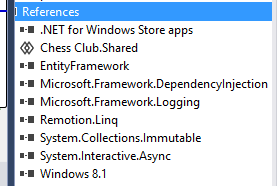 Since you did not link to where the Entity Framework 7 sources on GitHub are located I will assume it is the GitHub repository being used as part of ASP.NET vNext. The NuGet pre-release NuGet packages for ASP.NET vNext are available on MyGet. 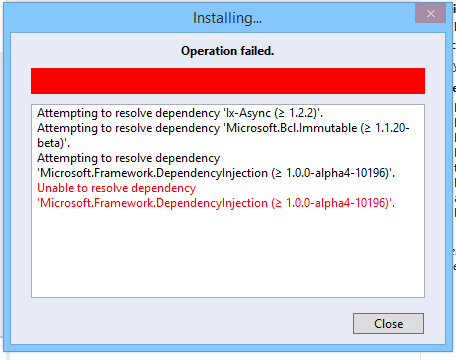 If you add the following url to your existing package sources, and enable it, then the Microsoft.Framework.DependencyInjection pre-release NuGet package should be resolved. 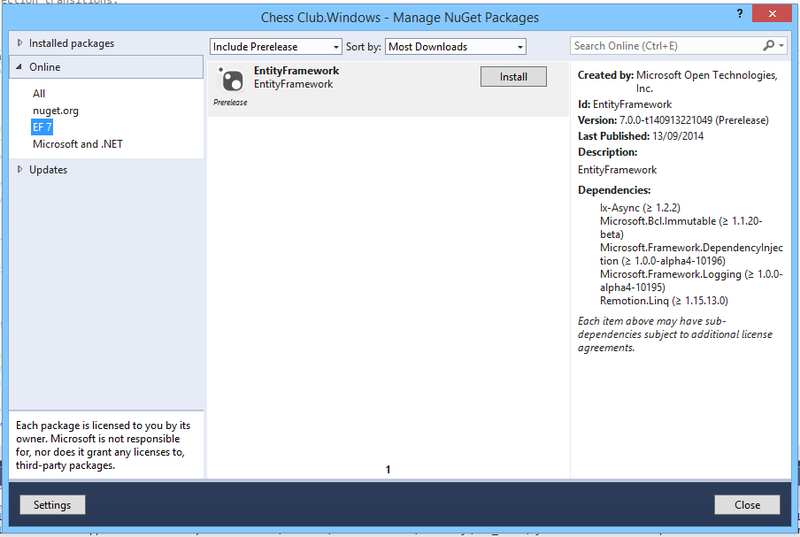 Also the Entity Framework 7 pre-release NuGet packages are also available from the above package source. So you may not need to build it yourself from source code.